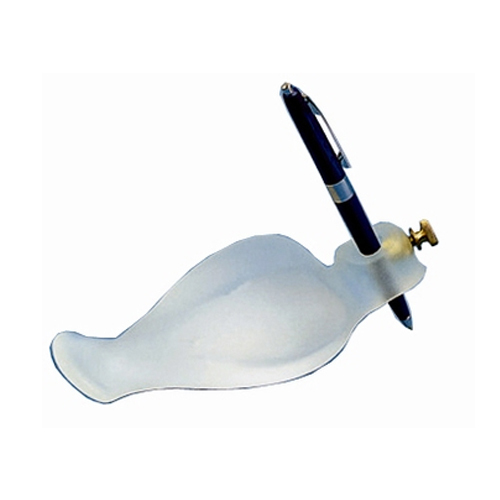 The Writing-Bird is a solution to relieve the stress of writing for people with arthritis, neurological disorders, limited hand control, limited dexterity, or a weak grasp. It is also an adaptive writing tool for individuals without thumb to fingertip pinch, or for someone with tremors that calm with weight or applied pressure. The Writing-Bird is an adaptive writing product that rests comfortably in your right or left hand. Gentle pressure on the tail allows the pen to move without smearing ink. The Writing-Bird slides along the writing surface by use of upper arm strength. Only slight downward pressure is needed to write. Made of durable, frosted acrylic. May be used with either the right or left hand. **Pen not included. Fits standard size pen or pencil.